Welcome to ICANN Reviews! The goal of this page is to provide you with a step-by-step guide to help introduce you to reviews, share key resources, and get you started with best practices to get involved. Reviews are important accountability mechanisms that are required by ICANN Bylaws and critical to maintaining a healthy multistakeholder model. There are two categories of reviews. Specific Reviews address a range of specific topics such as Accountability and Transparency (ATRT), Consumer Choice Confidence and Trust (CCT), Security and Stability (SSR) or Registration Directory Services (RDS) Organizational Reviews assess ICANN's Supporting Organizations (SOs) and Advisory Committees (ACs), to determine how effectively they operate, how well they achieve their purpose and how accountable they are to the multistakeholder community. Reviews deliver findings and recommendations to help improve ICANN, its SOs and ACs. Specific Reviews are anchored in Article 4.6 of the ICANN Bylaws. They are conducted by community-led review teams to assess ICANN's performance in reaching its commitments. 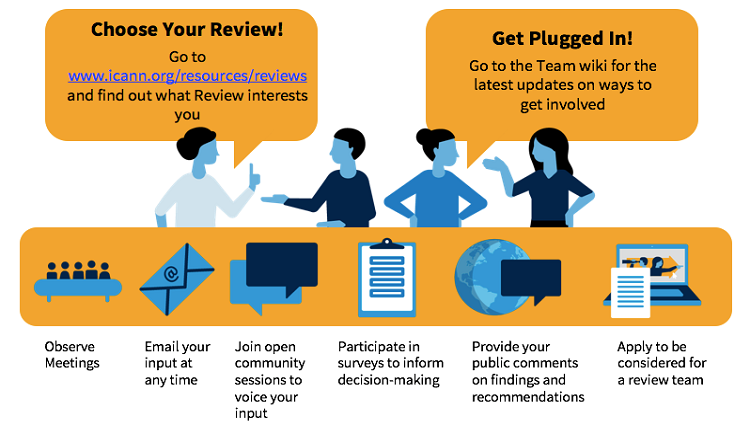 Click on "Specific Review Process" to learn about the different steps and participants that help move a review from start to finish. Familiarize yourself with the list of Specific Reviews provided and the key resources for each. For each review, there are two key pages: Review Home Pages on ICANN.org and the Review Wiki Workspace Page. Click "Get Involved" at the top right-hand side of the screen and sign-up to receive review-related updates. View the "Call for Volunteers" document for a high-level introduction to the background and scope of the review in progress. From here you can also find information on the process of selecting review team members, and the methodology, budget, and support provided by ICANN. Read the "Terms of Reference" document to gain insight into how the review team plans to conduct the review. Here you can find useful information that may include the review scope, timelines, roles and responsibilities, meeting rules, and the process by which community members such as yourself can become "Review Observers". Familiarize yourself with the draft report or final report of the previous review. These reports represent the accumulation of the work of previous review teams, including the key questions they worked to answer and the recommendations they provided. Being familiar with the final report from the last review provides good preparation for understanding the events that led up to active review that is currently in progress. Learn about the recommendations of each review and how they will be implemented by reading over the implementation plan that is created at the end of each review. Periodic updates are also provided to help you follow the progress of review implementation. Bookmark the Wiki Workspace Page for the review that interests you and check back routinely for new updates and opportunities to participate. Scroll through the news and updates section of the review that interest you to get a feel for the history of review activity and the significant events that have occurred. Find one or two key issues that you want to focus on. One way to do this is explore the different subgroups for each review. Subgroups are made up of review team members that are working on focused subject areas that are important to the review. You can find subgroups listed in the left-hand menu of the Wiki Workspace Page. To learn about each subgroup, view their key documents and follow the discussions available through their email list archive. Sign-up to become a "Review Observer" by subscribing to the review mailing list. You can choose to observe meetings of subgroup teams or the plenary calls where the entire team joins together to discuss the latest progress. You can either observe meetings live or look through the agendas of past meetings and listen to the recordings that are most relevant to your area of interest. Are you interested in becoming a review team member? 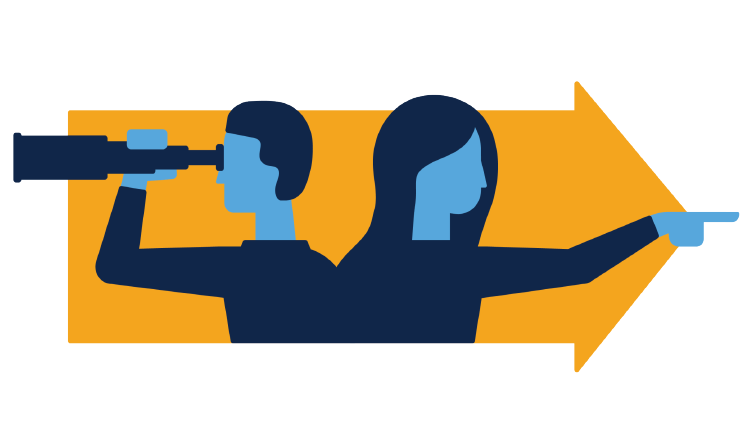 Becoming a review team member gives you the opportunity to provide subject matter expertise on the review topic and take on a core function in ICANN's multistakeholder decision-making model. Taking part in a review gives you the chance to work on an international team with a wide range of expertise on issues critical to supporting a secure, stable, and open internet for the world. Getting Selected. Review team members are chosen by Supporting Organizations (SOs) and Advisory Committees (ACs) leadership as mandated by ICANN Bylaws. If you are interested in becoming a review team member, we recommend becoming an active observer in existing reviews and also getting involved in one or more of the SOs and ACs that are responsible for selecting review team members. Stay up-to-date with Specific Reviews. Stay current with the latest progress of active Specific Reviews currently underway by bookmarking the Specific Review Status Update Table. Organizational Reviews are anchored in Article 4.4. of the ICANN Bylaws. They differ from Specific Reviews in that they are conducted by independent examiners and assess the effectiveness of ICANN's Supporting Organizations (SO's) and Advisory Committees (AC's). Visit the Organizational Review Page for links to the Organizational Review Process. From here you can also find a list of all the Organizational Reviews and links to two key resources for each: the Review Home Page on ICANN.org and Wiki Workspace Page. Similar to Specific Review Home Pages, the Organizational Review Home Pages provide a permanent file of essential milestones, outputs, and deliverables including the terms of reference outlining the scope of work, announcement of the selection of the independent examiners, the draft and final reports and the public comments for each. Here you can also find final recommendations, the implementation plan, and updates. The Wiki Workspace Page of Organizational Reviews provide key resources to follow the work of Independent Examiners and Review Working Groups that are selected to work with them. Stay current with the latest progress of active Organizational Reviews currently underway by bookmarking the Organizational Review Status Update Table. Do you have questions on Specific or Organizational Reviews? Reach out to us by emailing: reviews@icann.org. We are here to help!